In Amsterdam, a documentary film premiered on Garry Kasparov's unsuccessful campaign for Russian president. After purchasing your book on the PCG in 1997, I have been a fan of the complicated nature of the opening. I do have questions concerning a couple of the critical lines. A) Personally, after 1.e4 e5 2.Nf3 d6 3.d4 f5 4.Nc3, I have preferred 4...exd4 here, followed by 5...fxe4, liquidating the center at once, believing that 4...fxe4 5.Nxe4 d5 6.Neg5! is busted for Black. However, I have noticed in the database that you still play 5...d5 and your opponents have responded with 6.Nxe5 instead of 6.Neg5!. My first question is: what do you have in mind against 6.Neg5!? 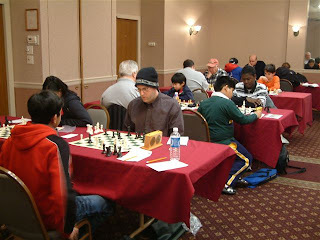 B) Most players (including computers) go for this: 1.e4 e5 2.Nf3 d6 3.d4 f5 4.dxe5 fxe4 5.Ng5 d5 6.e6. 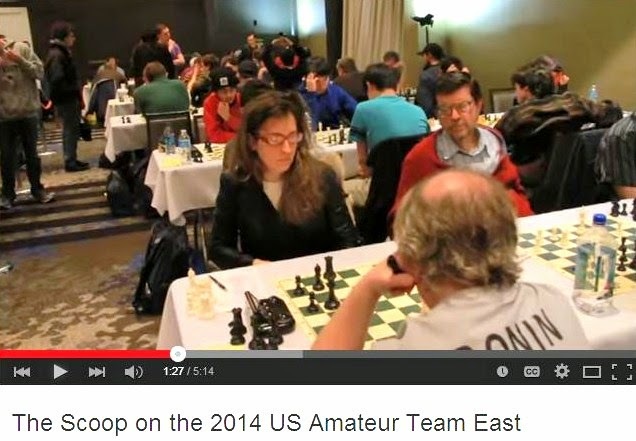 I see that you have played 6...Nh6 (which looks risky) and 6...Bc5 with success. Christian Bauer wrote a book on the Philidor, and he recommends 6...Nf6. I have tried this move against strong computer programs, and both games continued 6...Nf6 7.Nf7 Qe7 8.Nxh8 Be6 9.c4! !, and I found it hard to: (1) maintain the center, (2) develop the b-knight and ...O-O-O quickly, and (3) absorb the knight in the corner. My second question: is 6...Bc5 (6...Bb4+) the only playable move? C) And finally, in the first of the series of Secrets of Opening Surprises, an anti-Dutch remedy is given 1.Nf3 f5 2.d3 d6 3.e4 e5 4.Nc3 with the idea of exf5 and d4. Imagine, in a PCG move order, someone playing 1. e4 e5 2.Nf3 d6 3.Nc3 f5 4.d3!?. I could not imagine anything more stupid! However, White has been scoring well in this line. My question: what do you think of this, and have you ever faced it before? If this move order is best, then THIS line may be the true bust of the PCG, and White players will not have to mess around with any other line. A) After 6.Neg5!, Black should avoid 6...h6 7.Nf7! Kxf7 8.Nxe5+ or 6...e4 7.Ne5 Nh6 8.Nxe4! and should try 6...exd4 7.Nxd4 Qe7+ which I have used successfully. B) Other sixth moves may be playable for Black, but after experimenting with 6...Nh6 I now prefer 6...Bc5 with the idea of 7.Nc3 Nf6 8.Nf7 Qe7 9.Nxh8 Bxe6 which is an improvement on Bauer's line because: (1) Black's king bishop has developed, and (2) White does not have c4 at his disposal. 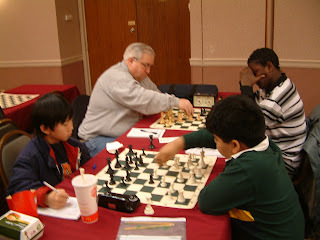 C) Responding to an e-mail on the game Carlsen-Dolmatov, Moscow 2004, here is what I wrote in April 2007. In my opinion, Dolmatov's mistake was in playing 4...Nc6 instead of the natural move 4...Nf6. By my count, I have reached the position after 1.e4 e5 2.Nf3 d6 3.Nc3 f5 4.d3 in ten games as Black. And in every one of them, I opted for 4...Nf6. 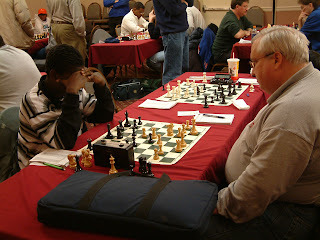 It is not clear whether Black's queen knight belongs on c6 or d7. Philidor himself would have frowned on a move like 4...Nc6 which obstructs the pawn on c7. 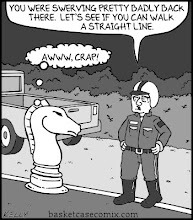 Probably Black's c-pawn belongs on c6 rather than the queen knight. My experience has shown that, in general, Black should play ...Nc6 only when White has already played Bc4. There are two reasons for this: (1) if Black plays ...Nc6 before White has committed his king bishop to c4, then White has the option of playing Bb5 without wasting a tempo; (2) with the white bishop on c4, Black often follows ...Nc6 with a timely ...Na5, which usually chases the bishop from the a2-g8 diagonal or exchanges favorably the black knight for the white bishop. 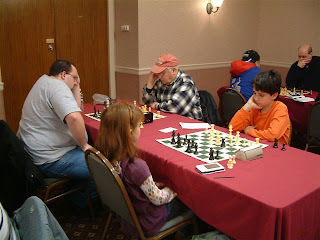 Many thanks to Atlantic Chess News editor Steve Ferrero and NJSCF webmaster Aaron Kiedes for these photos of Saturday's Viking quads in Somerset! 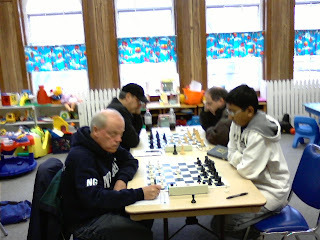 Yesterday Kavinayan Sivakumar and I finished tied for first place, with identical scores of 2-0-1, at the Viking quads in Somerset. Here are my games. 49.Rb5 Kd6 50.Rb7 Ke6 51.c5 Ra3 52.Kf3 g5 53.Rb6+ Kf5 54.Rb2 h4 55.Rf2 Rc3 56.Ke2+ Ke4 57.Kd2 Rd3+ 58.Kc2 Rxe3 59.c6 Kxd4 60.Rd2+ Kc4 61.c7, Black resigns. 31.h3 Bf4 32.Nd1 Bxe3 33.Nxe3 Qg3 34.Nf5 Bxf5 35.Rxf5 g4 36.hxg4 Rg8 37.g5 hxg5 38.Raf1 Rg6 39.Bh5 Rh6, White resigns. 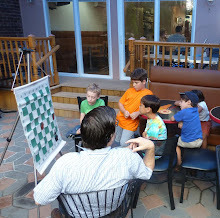 12.Qd1 Ne6 13.Qe1 O-O 14.Nc3 c6 15.Be3 Qc7 16.Rd1 Rfd8, draw. 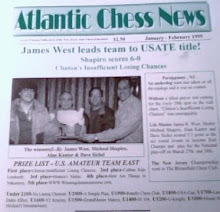 Here is an article, that will appear tomorrow in The New York Times magazine, on Bobby Fischer's most famous game. 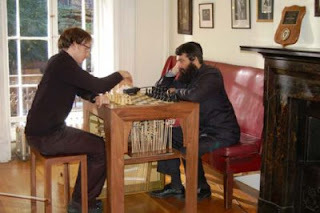 Guido van der Werve (left) and GM Leonid Yudasin at the chess piano during the filming of Mr. van der Werve’s new film taken at the Marshall Chess Club. 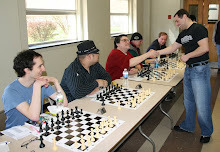 The filmmakers added to the excitement of the day as they prepared for the shoot at the Marshall Chess Club. The string ensemble taking direction from Mr. van der Werve at the Marshall Chess Club. 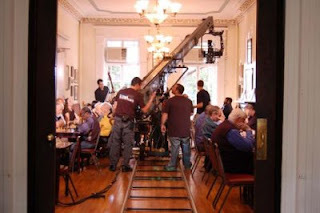 The filmmakers shown filming the opening scene at the Marshall Chess Club. 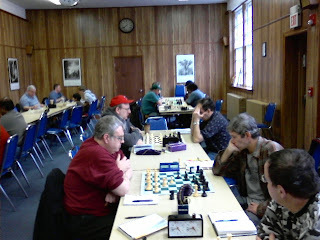 Columnist David W. Hatch (front right) can be observed participating while he plays the black pieces at the Marshall Chess Club. 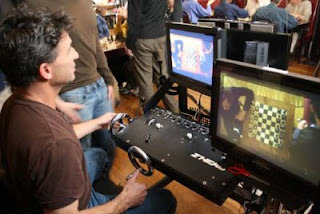 Here we have one of the filmmakers at the controls during the filming at the Marshall Chess Club. 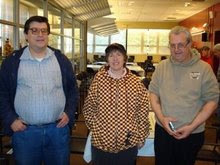 The second event was for us a once-in-a-lifetime experience. Dave responded to an open casting call to appear as an extra in a short film by Guido van der Werve, a member of the Marshall Chess Club, a composer of classical music, and an independent filmmaker. Mr. van der Werve was looking for chess playing “men who are 50 and up” to come to the Marshall Chess Club in New York City on October 6, 2008 to play chess “slowly and quietly” during the filming of the opening scene for his short film tentatively entitled, “Number Twaalf” (it being his 12th film). 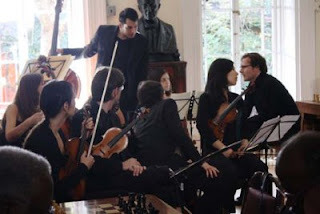 Mr. van der Werve’s classical composition for the film is titled “The King’s Gambit Accepted” and Mr. van der Werve and GM Leonid Yudasin did indeed play the KGA on the chess piano while the orchestra played Mr. van der Werve’s beautifully somber musical composition. When each move of a chess piece was pressed down on a square, the chess piano played a predetermined musical note composed specifically for that moment. We will not pretend to know the premise or theme or plot of this short film, but some of Mr. van der Werve’s work can be seen on his website http://www.roofvogel.org/ and we do look forward to seeing the completed project. 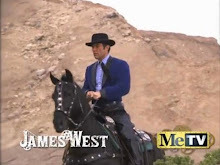 We did garner an appreciation for how much time and energy it takes to film a movie scene. Everyone involved worked tirelessly for over eight hours to set up, rehearse and film the 12-minute opening scene. A 10-person film crew, cameras, camera crane, crane tracks, sound recording equipment, film recording equipment, still cameras, lights, computers, a 9-piece string ensemble, and 18 chess players crammed into the upstairs playing room of the Marshall Chess Club and all worked in unison and harmony to help create Mr. van der Werve’s avant garde . . . uh . . . brilliancy! 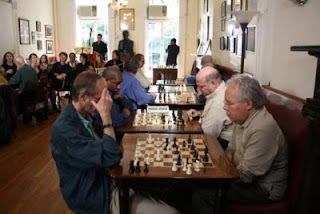 For us, it certainly turned out to be a worthwhile trip to New York City giving us the opportunity to play chess in the historical Marshall Chess Club and absorb some of the history, memorabilia and nostalgia of such a time-honored and prestigious establishment. Here is an article that tries to solve the riddle of Bird-Morphy, London 1858. It was one of three Philidor Counter Gambits won by Paul Morphy in his playing career. 1.e4 e5 2.Nf3 d6 3.d4 f5!? 4.Bc4 b5 5.Bxb5+ c6 6.Bc4 fxe4 7.Nxe5 dxe5 8.Qh5+ Kd7 9.Qxe5 Qe7 10.Qa5 g6 11.O-O Bg7 12.Bg5 Qd6?? 13.Qd8#. 6...fxe4 7.Bxe4 d5 8.Nxe5 dxe4 9.Qh5+ g6 10.Nxg6 hxg6 11.Qxh8 Be6 12.Nc3 Qf6 13.Qxf6 Nxf6 14.Bg5 Nbd7 15.O-O-O O-O-O 16.Rhe1 Bd5 17.Nxd5 cxd5 18.f3 Re8 19.Rd2 Nh7 20 Bf4 g5 21.Bg3 Nhf6 22.Rde2 Bh6 23.Kd1 Kd8 24.c4 g4 25.cxd5 gxf3 26.gxf3 e3 27.Bh4 Kc7 28.f4 Nxd5 29.Bg5 Bg7 30.h4 Bxd4 31.h5 Nc5 32.h6 Kd6 33.Rh1 Nd3 34.b3Nf2+ 35.Rxf2 exf2 36.h7 Rh8, 0-1, IM Pugno –Zilbermintz, 3/30/2008, ICC 3 0 rated blitz. 6...fxe4 7.Bxe4 d5 8.Nxe5 dxe4 9.Qh5+ g6 10.Nxg6 hxg6 11.Qxh8 Be6 12.O-O Qe7 13.Re1 Bg7 14.Qh7 Qf7 15.Rxe4 Nd7 16.Be3 Ndf6 17.Rxe6+ Qxe6 18.Qxg7 Qf7 19.Qh8 O-O-O 20.Qh3+ Kb8 21.Nc3 Ne7 22.Re1 Ka8 23.Qf3 Qg7 24.Bg5 Ned5 25.Bxf6 Qxf6 26.Nxd5 Qxf3 27.Nc7+ Kb7 28.gxf3 Kxc7 29.Re7+ Kb6 30.c3 Rd6, 0-1 in 55 moves on time, IM Walaa Sarwat (FIDE 2386) – Zilbermintz, 3 0 rated blitz, ICC, 12/27/2007. 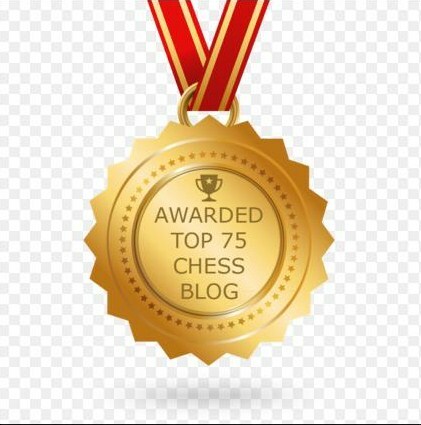 We now follow the games with the most popular move order, that being: 7.Nxe5 dxe5 8.Qh5+ Kd7. 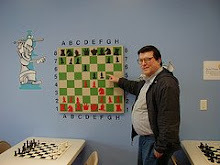 The following game was played only five days after the invention of the Newark Gambit. Kedyk being a strong and ambitious master-level player, I figured my new gambit would surprise him. That is exactly what happened!! Here is the game. 1.e4 e5 2.Nf3 d6 3.d4 f5 4.Bc4 b5!? 5.Bxb5+ c6 6.Bc4 fxe4 7.Nxe5 dxe5 8.Qh5+ Kd7 9.Qf5+ Kc7 10.Qxe5+ Kb7 11.Bf4 Nf6 12.Nc3 Bb4 13.O-O Re8 14.Qg5 Na6 15.a3 Bd6 16.Bxd6 Qxd6 17.Qxg7+ Re7 18.Qg5 Ng4 19.Qh4 Bf5 20.Rfe1, and 0-1 eventually in time scramble. 1.e4 e5 2.Nf3 d6 3.d4 f5 4.Bc4 b5!? 5.Bxb5+ c6 6.Bc4 fxe4 7.Nxe5 dxe5 8.Qh5+ Kd7 9.Qxe5 Bd6 10.Qxg7+ Ne7 11.Bg5 Qf8 12.Qxf8 Rxf8 13.Nd2 Bf4 14.Bxf4 Rxf4 15.O-O Ba6 16.Bxa6 Nxa6 17.Rae1 Rg8 18.Nxe4 Nd5 19.c4 Ndb4? [Here the correct move is 19…Nf6! 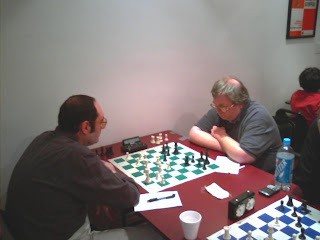 which I did not find], Black lost in 50 moves, Yair-Zilbermintz, 5/29/2008, ICC, 3 0 rated blitz. 1.e4 e5 2.Nf3 d6 3.d4 f5 4.Bc4 b5!? 5.Bxb5+ c6 6.Bc4 fxe4 7.Nxe5 dxe5 8.Qh5+ Kd7 9.Qxe5 Bd6 10.Qxg7+ Ne7 11.Bg5 Qf8 12.Qxf8 Rxf8 13.Nc3 Nf5 14.O-O-O Ba6 15.Bxa6 Nxa6 16.Nxe4 Be7 17.Bxe7 Nxe7 18.c3 Nc7 19.Nc5+ Kc8 20.f3 a5 21.Rde1 Ned5 22.c4 Nf4 23.g3 Ng6 24.f4 Na6 25.Ne4 Kc7 26.a3 h6 27.Nc3 Rad8 28.Rd1 Rfe8 29.Kc2 Re3 30.d5 Nc5 31.dxc6 Rxd1 32.Rxd1 Kxc6 33.b4 axb4 34.axb4 Nd7 35.Kd2 Re8 36.Ra1 Kb7 37.c5 Nf6 38.b5 Ne4+ 39.Kd3 Nxc3 40.Kxc3 Ne7 41.Re1 Nd5+ 42.Kd2 Rxe1 43.Kxe1 Nc3 44.g4 Nxb5 45.h4 Nd4 46.h5 Ne6 47.g5 hxg5 48.fxg5 Nxg5 49.Kd2 Kc6 50.Ke3 Kxc5 51.Kf4 Nh7 52.Kf5 Kd6 53.Kg6 Nf8+ 54.Kf7 Nh7 55.Kg7 Ng5 56.h6 Ke6 57.h7 Nxh7 58.Kxh7, draw. We’ll continue with our discussion of the Newark Gambit: The Antidote To 4.Bc4 In The Philidor Counter Gambit – Part III in our next issue of Atlantic Chess News! 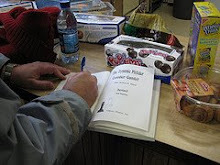 The Dumont Chess Mates library has a wide range of chess books, including my first edition on the Philidor Counter Gambit. 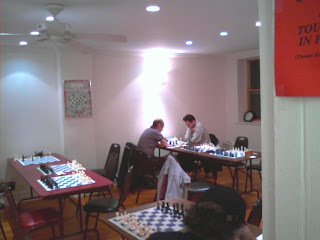 Against blogger Polly Wright [pictured above, playing White against Bora Yagiz in round two], I was fortunate to draw this contest in last night's game/30 quad at the Marshall Chess Club. 30.Nd5 Bxd5 31.Rxd5 Bxb2 32.Ra2 Bg7 33.c4 Nxe4 34.Bxe4 Qxe4 35.Qxe4 Rxe4 36.Bf2 Rxc4 37.Rxd6 Rbc8 38.a5 Rc1+ 39.Kg2 Be5 40.Rd7 bxa5 41.Rxa5 Bf4 42.Raxa7 Rf8 43.h4 Rc2 44.Kf3 Be5 45.Rd3 Rb2 46.Bg3 Bxg3, draw. I took these pictures yesterday at the Hamilton quads. 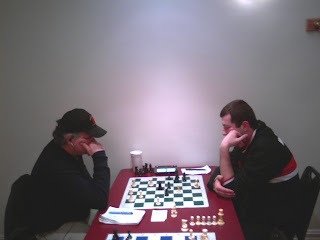 Here are two photos of NM Dragan Milovanovic, playing in quad one against national masters Michael Thaler and Mark Kernighan respectively. 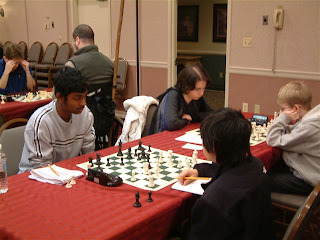 In quad two, Tim Hall has White against Rahul Swaminathan while Kevin Dresher has Black against Greg Nolan. 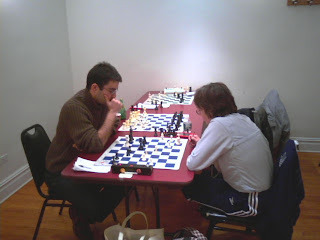 In the lower quads, bloggers Atomic Patzer and Diamondback play White at adjoining boards. 33.Ng4 Bf4 34.Nf6 Rf8 35.Nxe4 Bxh2 36.Nxd6 Rxf2 37.Ne4 Re2 38.Rd4 a5 39.Nd2 Be5 40.Rd5 a4 41.Nc4 Bf6 42.Rb5 Be7 43.Ne5 b3 44.axb3 axb3 45.Nd3 Bf6, draw. On Saturday, Garry Kasparov launched a new anti-Kremlin movement called Solidarity. The next day, at least 90 demonstrators were detained by police in Moscow. Due to the economic downturn, Universal Pictures has scrapped its plans to film Bobby Fischer Goes to War. 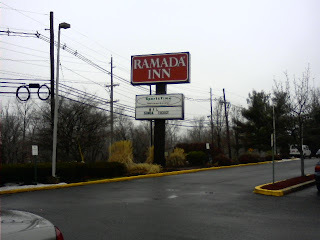 Not advertised in Chess Life because it is unrated, a scholastic event called the Greater South Jersey Individual Championship Tournament will take place on December 20th in Cherry Hill. 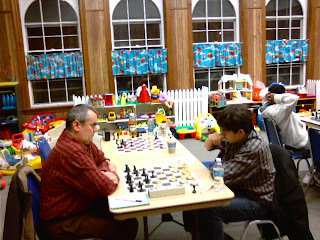 These are the two best games, as judged by me, from the 2008 Dumont Chess Mates Club Championship. In the open section, Newark Sleepless Knights president Jess Ragaza gets outplayed. 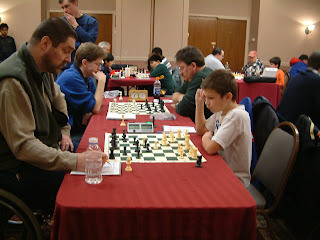 In the under 1700 section, 8-year-old Nicholas Katz upsets his higher rated opponent. 22.Rg2 Re8 23.Nf3 Bf4+ 24.Nd2 Re1#. 31.Kf3 Kf8 32.Ke3 Ke7 33.d4 Kd6 34.d5 h6 35.Kd3 Kc5 36.Kc3 g6 37.g4 f6 38.h4 g5 39.h5 Nb8 40.d6 Kxd6 41.Kb4 Kc6, White resigns. 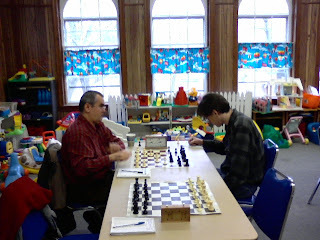 These pictures were taken by me during round three of yesterday's Marshall CC December Open, at the Marshall Chess Club. 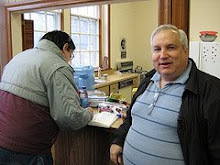 Jerry Monaco defeated Steven Khais. 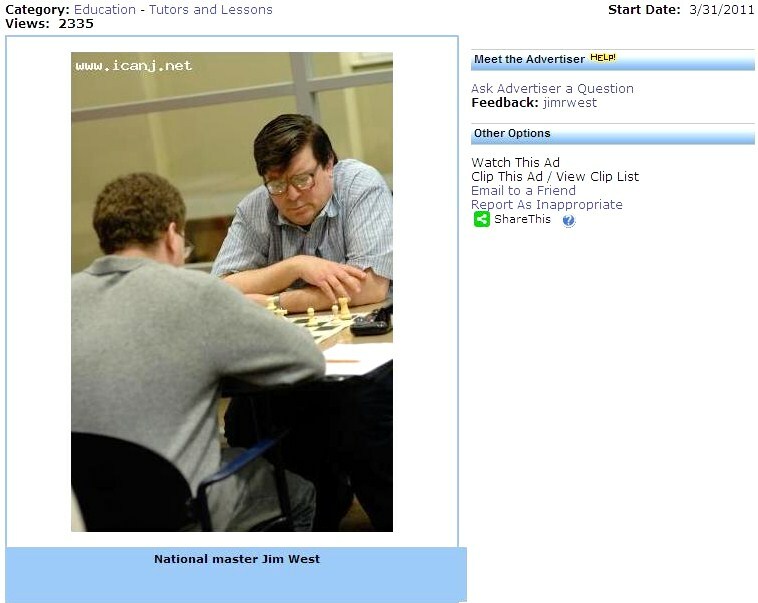 Here are two photos of Jason Margiotta, who lost to NM Boris Privman. George Berg held IM Jay Bonin to a draw. 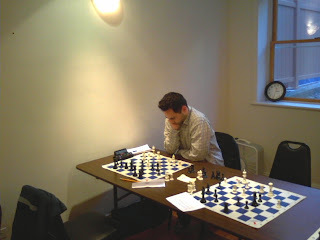 Playing in the one-day schedule of today's Swiss tournament at the Marshall Chess Club, I finished with a score of 2-0-2, drawing my games as White and winning my games as Black. 35.h4 Qc1+ 36.Kh2 Qc7+ 37.Kh3 Qc1 38.b4 f5 39.Rxe6 Qh1+ 40.Kg3 f4+ 41.Kf2 Qxh4+ 42.Kg1 Kf7 43.Rdd6 g5 44.Re4 Qg3 45.Rdd4 h4 46.Rd7+ Kf6 47.Rh7 Kg6 48.Ree7 Kf6 49.Re2 Kg6 50.Rh8 Kg7 51.Ree8 Kf7 52.Rhf8+ Kg7, draw. 17.f3 c4+ 18.Ke3 Qxc3+ 19.Ke2 Nbc6 20.Rc1 Qb2+ 21.Ke1 Qb4+ 22.Rd2 h6 23.Be2 c3 24.Rdc2 hxg5 25.hxg5 Nd4 26.Qd3 Bd7 27.Rd1 Nxc2+ 28.Qxc2 Ba4, White resigns. 16.c4 cxd4 17.Bxd4 Bf4 18.Bxf6 Rxf6 19.Rhf1 c6 20.Kc2 Bxd2 21.Rxd2 Be6 22.Kc3 Rbf8 23.cxd5 cxd5 24.Bb5 e3 25.Re2 exf2 26.h3 h5 27.Bc6 Rc8, White resigns. 16.Rxf7 Rxf7 17.Bxe6 Raf8 18.Bxf7+ Rxf7 19.e6 Rf8 20.exd7 Qxd7 21.Bxg7 Qc6 22.Qe2 Rf5 23.Bd4 Rg5 24.Rd2 Bc5 25.Bxc5 Qxc5+ 26.Kh1 Bxg2+ 27.Qxg2 Rxg2 28.Rxg2+ Kf7 29.a3 Qe3 30.Ne2 h5 31.Ng1 Qe4 32.h3 Qd5 33.c3 Qe4, draw.